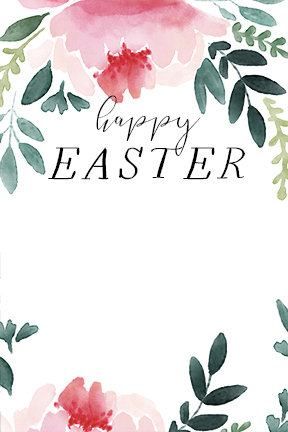 I wanted to thank all you fans for your support, and so I created this free Easter Greeting Photo Card. All you need to do, is download it, add your photo, then print. This download is free for home personal use forever and limited commercial use during the month of March, 2018. If you are an independent photographer, feel free to use it for your client's. If you are a blogger or social media lover, it would also make a pretty background for your posts. Let me know what you think, what you would like to see more of, or any questions you have in the comments below. And, if you love these freebies, tell your friends so they can get in on the fun too! PS: Below is what your download will look like before you add your photo or text. It is sized to be printed 4" x 6", but there is enough resolution to scale it up to 8 x 12" if printing on a home printer. You could even scale it up, cut off the bottom half and have one cute wall sign for the season. Enjoy! Click here to get your free Photo Card.